FIDO Universal 2nd Factor (U2F) is an open authentication standard that strengthens and simplifies two-factor authentication using specialized USB or NFC devices. This document explains how to use the Gluu Server's included U2F interception script to implement a two-step, two-factor authentication (2FA) process with username / password as the first step, and any U2F device as the second step. For more background on U2F, including a discussion of its security advantages, visit the Yubico blog. At least one U2F device for testing, like one of the devices listed below. For Linux based operating system, a little modification required in udev rule, that is stated below. Purchase U2F devices on Amazon. Or, check FIDO's certified products for a comprehensive list of U2F devices (sort by Specification == U2F). Navigate to Configuration > Manage Custom Scripts. 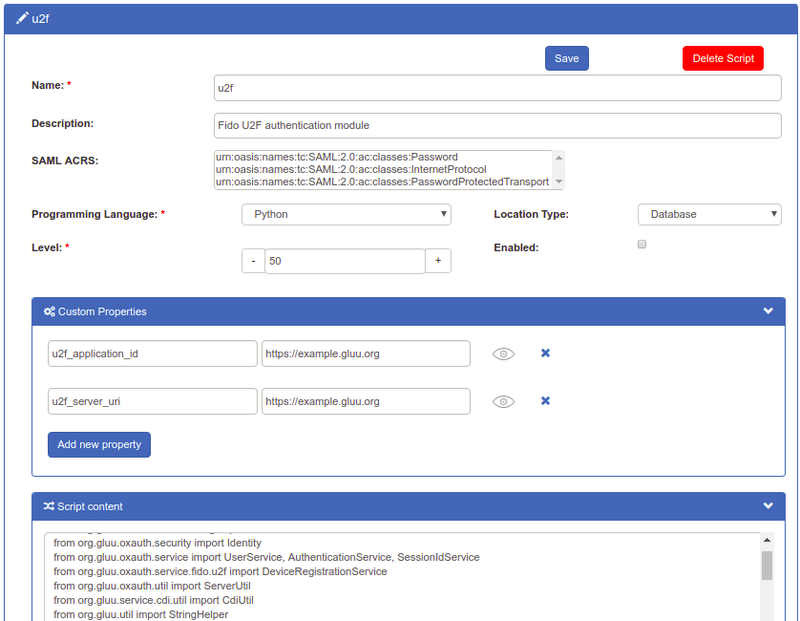 Now U2F is an available authentication mechanism for your Gluu Server. This means that, using OpenID Connect acr_values, applications can now request U2F authentication for users. To make sure U2F has been enabled successfully, you can check your Gluu Server's OpenID Connect configuration by navigating to the following URL: https://<hostname>/.well-known/openid-configuration. Find "acr_values_supported": and you should see "u2f". Navigate to Configuration > Manage Authentication. Select the Default Authentication Method tab. In the Default Authentication Method window you will see two options: Default acr and oxTrust acr. oxTrust acr sets the authentication mechanism for accessing the oxTrust dashboard GUI (only managers should have acccess to oxTrust). Default acr sets the default authentication mechanism for accessing all applications that leverage your Gluu Server for authentication (unless otherwise specified). If U2F should be the default authentication mechanism for all access, change both fields to U2F. If U2F is set as a default authentication mechanism users will not be able to access the protected resource(s) while using a mobile device or a browser that does not support U2F (e.g. Internet Explorer). The design is being rendered from the U2F xhtml page. To customize the look and feel of this page, follow the customization guide. U2F device enrollment happens during the first authentication attempt. All subsequent U2F authentications for that user account will require the enrolled U2F key. A users FIDO U2F devices can be removed by a Gluu administrator either via the oxTrust UI in Users > Manage People, or in LDAP under the user entry as shown in the below screenshot. A discovery document for U2F is published by the Gluu Server at: https://<hostname>/.well-known/fido-configuration This document specifies the URL of the registration and authentication endpoints. The endpoint was https://<hostname>/.well-known/fido-2fa-configuration in previous versions, but has been deprecated in version 3.1.6. For a discussion of how to manage FIDO devices using the SCIM protocol, see the SCIM documentation. From your terminal run below commands and reboot your computer. 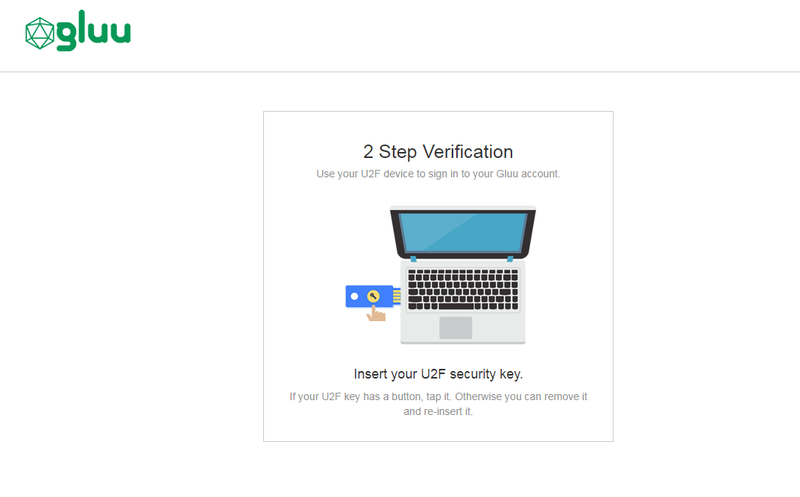 To offer end-users a portal where they can manage their own account security preferences, including two-factor authentication credentials like U2F keys, check out our new app, Gluu Casa.